Based in Mumbai, we have acquired a place of prominence in the global markets as the Manufacturer, Supplier and Exporter of the Rubber Bellows of superlative quality. 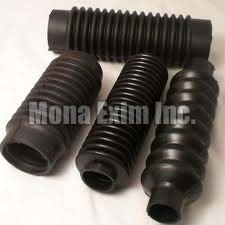 We furnish these Rubber Bellows in diverse dimensions, designs and other specifications to facilitate our clients. Further, the flawlessness of the Rubber Bellows is confirmed via rigorous testing on crucial industry parameters. Count on us, for rational prices.